If you are like me, you probably need a morning boost. I’m not a huge breakfast eater; I’m just not very hungry after I wake up. I have always been this way. But, I am definitely thirsty when I wake up! 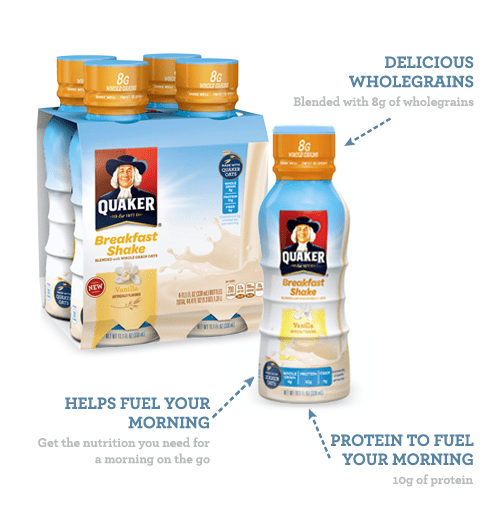 I am so glad to have come into contact with Quaker Breakfast Shakes because these things have changed my morning life! 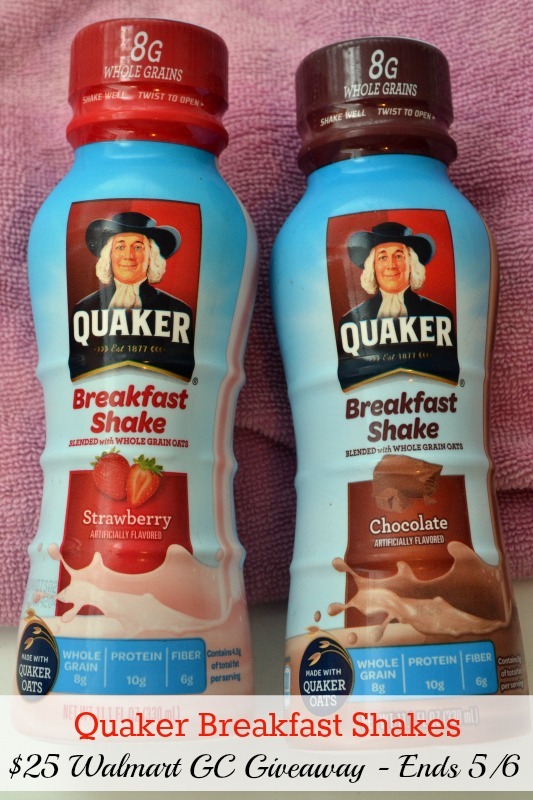 Quaker Breakfast Shakes are available in three delicious flavors, including chocolate, strawberry and vanilla, you get great nutrition with the 10 grams of protein, 8 grams of whole grains, 6 grams of fiber and are only 200 calories each! I love that I’m still getting nutrition while being able to drink something delicious! And the fact that I can just take it out of the fridge and not have to actually make anything, is the best thing of all for me! My favorite is the strawberry – it reminds me a bit of the strawberry milk I loved growing up. I highly recommend these Breakfast Shakes if you are an on-the-go person or even a stay-at-home mom. It’s a great way to make sure you’re getting nutrition in the morning, but don’t have the time to make a meal. Make sure to grab this $2 off coupon when you go shopping – you can never save too much money! Quaker has been kind enough to provide a $25 Walmart gift card giveaway, as well! You’ll be able to pick up some of these delicious shakes for you and your family! To enter, simple use the Rafflecopter form below. This giveaway will end May 6th at 11:39pm EST. A winner will then be chosen and have 48 hours to reply, otherwise a new winner will be chosen. Good luck to all who enter! I look forward to the strawberry the most. I would like the vanilla flavor the most. I think the Strawberry flavor would be really good! I’d Love To Try The Strawberry Flavor! chocolate for me, always and forever. I love chocolate so that has to be my choice. I would love to try the Strawberry ! !